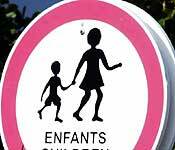 This may well be one of the Leeward Islands, but that doesn't put them out of the wind of the French Administration: the Children's crossings are French, the Men at Work signs also, and the same is true for the Falling Rocks. Sigh. 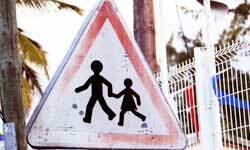 This sign is technically speaking not a warning sign for a children's crossing. 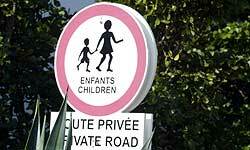 It is a sign that forbids children to enter the premises. 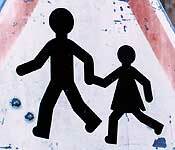 It is peculiar because the composition is à la U.K. where the girl is the bigger person dragging the boy. The drawing reminds me also of a sign found in Hungary (the climate explains the difference in clothing).